Janis Schachter’s News Literacy class at Northport High School, Northport, New York. Photo by John Griffin, Stony Brook University. STONY BROOK, NY, USA – August 3, 2018 – At a time of unprecedented concern about the spread of false and misleading news, the Stony Brook University School of Journalism’s Center for News Literacy is bringing together teachers from more than 20 New York State school districts for an immersive, three-day workshop that will equip them with the skills and tools to teach the center’s proven and widely-praised News Literacy curriculum to their students – as young as 11 – this fall. The News Literacy Summer Academy will take place at Stony Brook University August 20-22. The academy will be led by Howard Schneider, dean of the School of Journalism at Stony Brook and founder of the Center for News Literacy in 2006, and the center’s faculty. Over the past decade, the center’s pioneering curriculum has been taught to more than 15,000 students at Stony Brook, more than two dozen other U.S. universities and in 10 countries. The center’s curriculum is now ready to be adapted and adopted by every middle and high school classroom in America, according to Schneider. The more than 30 middle school and high school educators will hear from fellow teachers who have already utilized the center’s News Literacy curriculum in their classrooms, and will be welcomed by New York State Regent Roger Tilles. In addition, presenters will also include officials from the State Department of Education, and Dr. Joel Breakstone from Stanford University, who helped lead a landmark study of how well America’s schoolchildren can judge the reliability of news sources and outlets on the internet. The participants, who hail from school districts across New York City, Long Island, Westchester and upstate New York, will also have opportunities to work together to create their own News Literacy lessons that they’ll be able to bring back to their classrooms in September. The academy was made possible thanks to substantial support from the Rauch Foundation. Jonathan Anzalone, assistant director of the Center for News Literacy, said he believes the academy will generate enthusiasm among educators for News Literacy and the potential of the curriculum to have a transformative effect on student learning. “Our hope is that participants will leave the academy feeling as if they are part of a community and support network of News Literacy educators who will share ideas and resources, and continue to spread News Literacy and amplify its impact on students,” Anzalone said. 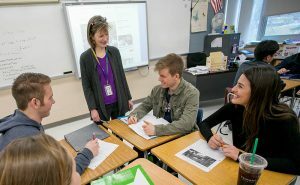 Schneider noted how important News Literacy training is for young students, who need to develop crucial citizenship and critical thinking skills for the 21st Century. He said he believes New York State can be a leader in this movement. Established in 2006, Stony Brook’s School of Journalism offers one of the most comprehensive, hands-on journalism programs in the country, and is the only undergraduate journalism school in the State University of New York public higher education system. In addition to its academic program, the school oversees two centers: The Center for News Literacy and The Marie Colvin Center for International Reporting. The School of Journalism is also the founding home of the Alan Alda Center for Communicating Science. For more information, visit stonybrook.edu/journalism or centerfornewsliteracy.org.